Adjusting Habaki Seppa (metalwork) are generally to meet Blade Nakago, and done in shorter period, and the followings are the summery of noticeable comments by the Japanese Shirogane-shi (fitting craftsmen) of our Tsuka and Saya making class in Japan. All Nihonto blades are made full custom, and each Nakago of blade has diffeent shape and size. Therefore, newly aquired Habaki Seppa are frequently required the adjustment to meet Nakago, using files. When Habaki Seppa are considerably larger than Nakago of blade, Seppa meight be moving around and Habaki meight not support blade in Saya properly. 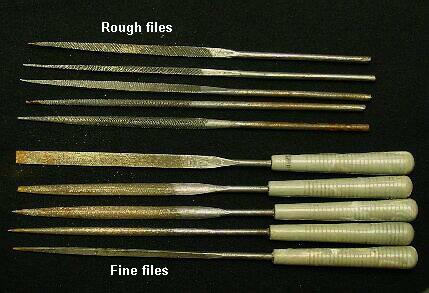 Usually Rough Files(see below photo) are used for fast reduce the unwanted area of Habaki and Seppa; then, Fine Files(see below photo) are used for finishing. The finish of Fine Filies is similar to mirror finish, it is for smoothing surface purpose only (but not think to reduce unwanted area.). Note: Always watch over filing. 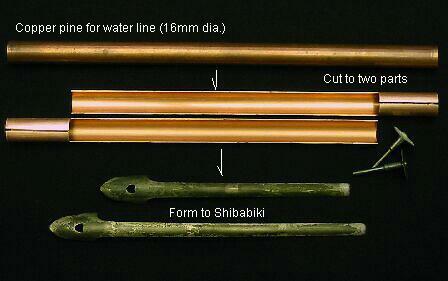 Shibabiki is use for end of Saya with Kojiri and Semegane/Kashiwaba to protect cracking Saya end. Above photo was from our Tsuka Saya our Tsuka and Saya making class in Japan, using copper water pipe. 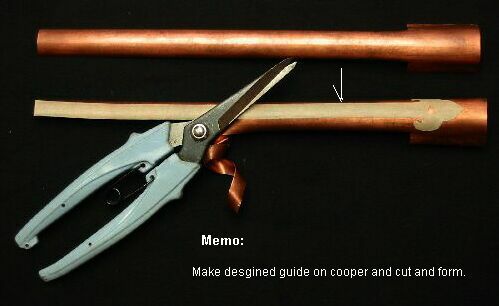 Cutting copper pipe (16mm dia.) by Dremel with cutting tip, and shaped by files. The Above poto also showes the original Edo era made Shibabiki as example. Note: Place designed paper/tape is advisable. Silver plating There are two easy way for Silver plating, one is electrolyze type and other is non-electrolize type. Below is electrolyze type and easy and lowest cost method of Silver plating. Power supply (12V /1A or greater) - Silver plating time is up to power rate and other condition. Note: If no use Power supply (npn-electrolyze type), it will take several days. Put Silver cleaning liquid to longer container (non-metal); complately sink Shibabiki and Silver; attack positive (+) to Silver and negative (-) to Sibabiki; wait for changing color. ; at last wash well with water. Note: Watch never contact Silver and Shibabiki in the liquid (aware short sercuit). Nanatugame is the loop to hook up Tachi to Obi (belt), passing through Ashi-kanamono, made of leather (or chain/Kumihimo) with some metal fixture. Design and cut stronger leather (cow skin) to make Shin (inner/center leather), which must be able to hold Tachi; then, cover thin deer hide, which called Ashigawa. Then, rolled up passing through Ashi-kanamono. 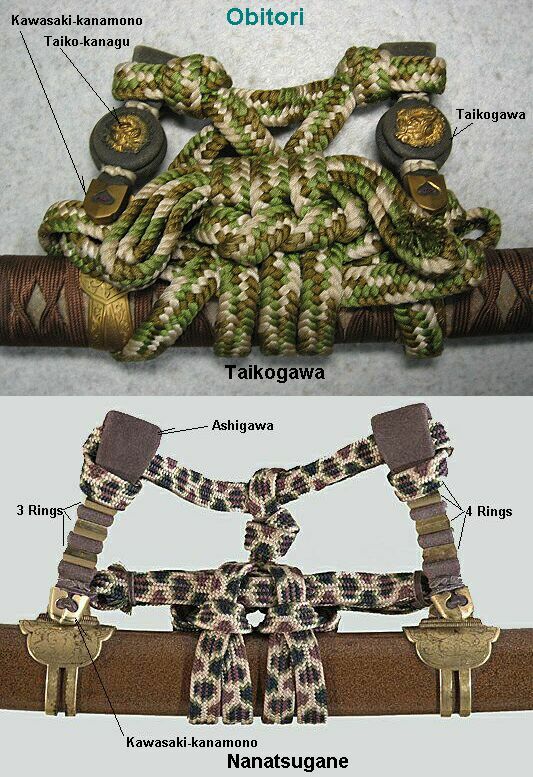 Install 3-rings at Ichino-Ashi (Tsuka side Ashi-kanamono) and 4-rings at Nino-Ashi (end of Saya side) on Ashigawa, at near to Ashi-kanamono, and press Ashigawa to fix entire leather part. Attach Ashisaki-kanamono to the outside end of Ashigawa. Obitori or Tachi Sageo must be passed through upper loop of Ashigawa. Note: Do not over press Rings. Taikogawa is the loop to hook up Tachi to Obi (belt), passing through Ashi-kanamono, made of leather with some metal fixture. (Taiko means drum.) 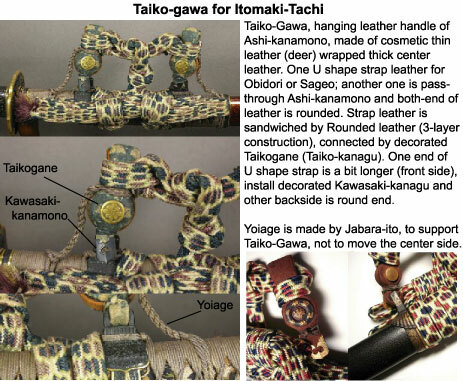 Uchimaki (inner belt) : Design and cut stronger leather (cow skin) to make Shin (inner/center leather), which must be able to hold Tachi; then, cover thin deer hide. Sotomaki (outer belt) : The same way , design slightly slim but thick at Taiko part. Then, attach inner and outer belts and rolled up, passing through Ashi-kanamono. Attach Ashisaki-kanamono to the outside end of Ashigawa, and insert Taiko-gane to the center of Taiko part to fix entire leather part. Obitori or Tachi Sageo must be passed through upper loop of Taikogawa , and install Yoiage to support Taikogawa. (Usually Tsuka-ito or Kumihimo is used for Yoiage. Note: Make tight between Ashi and Taiko parts. Note: Please refer to respective published books, videos or each professional's site for more details to metalwork.